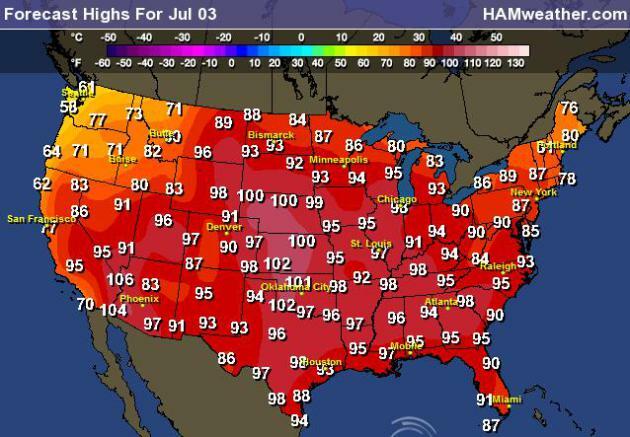 According to the Associated Press, "this U.S. summer is what global warming looks like." The usual disclaimers about weather vs climate are at the link. If you want a glimpse of some of the worst of global warming, scientists suggest taking a look at U.S. weather in recent weeks. Horrendous wildfires. Oppressive heat waves. Devastating droughts. Flooding from giant deluges. And a powerful freak wind storm called a derecho. These are the kinds of extremes climate scientists have predicted will come with climate change, although it's far too early to say that is the cause. Nor will they say global warming is the reason 3,215 daily high temperature records were set in the month of June. [snip] Climate scientists have warned that climate change would bring, in general, increased heat waves, more droughts, more sudden downpours, more widespread wildfires and worsening storms. In the United States, those extremes are happening here and now. So far this year, more than 2.1 million acres have burned in wildfires, more than 113 million people in the U.S. were in areas under extreme heat advisories last Friday, two-thirds of the country is experiencing drought, and earlier in June, deluges flooded Minnesota and Florida. "This is what global warming looks like at the regional or personal level," said Jonathan Overpeck, professor of geosciences and atmospheric sciences at the University of Arizona. "The extra heat increases the odds of worse heat waves, droughts, storms and wildfire. This is certainly what I and many other climate scientists have been warning about." More than one million residential customers remain without electricity since last Friday's "freak storms" swept across the mid-Atlantic. Utility companies say it will be days before service is restored to many of those affected.